William Faulkner attended the University of Mississippi and lasted only three semesters. He skipped classes, managed to pull a D in English, and then dropped out in 1920. 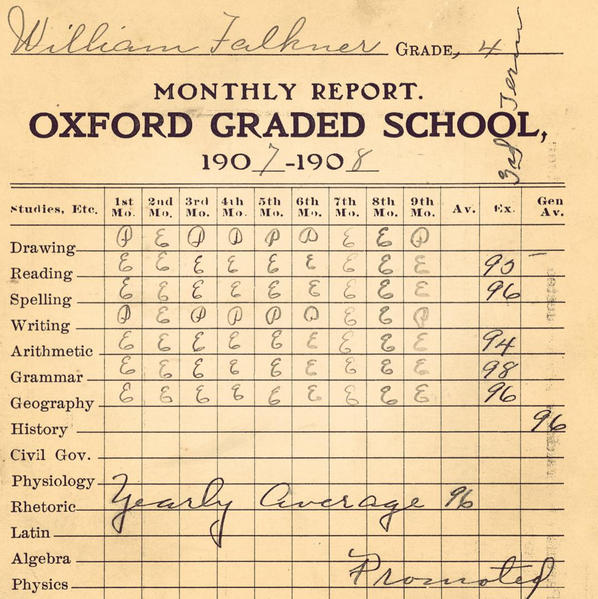 A far cry from his academic performance in 1907-1908 when, as a fourth grader, he got mostly E's (presumably meaning "Excellent"), a yearly average of 96, and a high grade of 98 in Grammar. Faulkner's 4th grade report comes to you courtesy of The Harry Ransom Center's Instagram account. Give it a follow. Either the teacher misspelled her own student’s name, or this was not “Faulkner’s” report card.